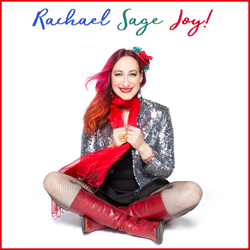 Award-winning singer, songwriter and multi-instrumentalist Rachael Sage will release her first holiday collection,&nbsp;"Joy! ", on&nbsp;November 10, 2017&nbsp;via MPress Records/ILS/Caroline. "The Carole King of her generation"
Award-winning singer, songwriter and multi-instrumentalist Rachael Sage will release her first holiday collection, "Joy! ", on November 10, 2017 via MPress Records/ILS/Caroline. The self-produced, 5-track EP was recorded and mixed by Grammy® nominee John Shyloski (Diana Ross, Stephen Kellogg) and Grammy@ winner Andy Zulla (Idina Menzel, Rod Stewart) and features Sage's longtime band The Sequins along with a variety of guest musicians. Rachael Sage never ceases to surprise. Whether it's via her innovative, often handmade stage-costumes or unlikely collaborations with artists such as Howard Jones and Judy Collins, the colorful multi-instrumentalist is never afraid to give things her own spin. "Joy! ", her first EP of holiday-centric material, is no exception. The collection includes two original Hanukkah songs, a Yiddish ballad, and a cover of the timeless holiday classic "Joy To The World" with percolating acoustic guitar, chamber strings, and an exuberant but intimate vocal delivery. Sage is no stranger to performing holiday material. The festive, tongue-in-cheek "Tchatchkes & Latkes" was penned for her annual holiday show at NYC's legendary Joe's Pub, along with fan favorite, "Hanukkah In The Village" (which Sage has previously performed on the Fox 5 Morning Show). "Umru Meine", Sage's first-ever Yiddish recording, was debuted earlier this year at Skirball Center For The Performing Arts, where she sang it alongside Tovah Feldshuh, David Hyde Pierce and other Broadway performers as part of a National Yiddish Theatre gala event. Featuring playful imagery by renowned New York photographer Bill Bernstein ("Disco", Paul McCartney), the festive EP packaging also includes a recipe for Romanian latkes, lovingly contributed by a friend's bubbe, a.k.a. grandmother. Full track listing below. Pre-order of the EP available HERE. 1) "Joy To The World"
4) "Hanukkah In The Village"
Rachael Sage is a soulful vocalist above innovative multi-instrumentalist who has earned a loyal following with her dynamic piano playing, delicate guitar work, expressive vocals and improvisational audience interaction. "Joy!" Rachael’s first holiday EP, is a playful folk-pop collection featuring a cover of the classic “Joy To The World” – an uptempo re-vamp with a tinge of Americana twang. Other tracks include Sage’s original Hanukkah song “Tchatchkes & Latkes”, and her first Yiddish recording, “Umru Meine”. Sage has shared stages with Judy Collins, Shawn Colvin, Dar Williams, Beth Hart, Colin Hay, and Ani DiFranco. She’s received numerous songwriting awards including The John Lennon Songwriting Contest (Grand Prize) and several Independent Music Awards. A record-breaking 22 placements on Lifetime’s TV series "Dance Moms" have resulted in 10 million+ YouTube views. Look for Rachael’s forthcoming album, "Myopia", out this Spring on MPress Records/ILS/Caroline.